I think all of us know that emotions are linked to physiological changes — nervousness and sweaty palms, shame and a hot head/cheeks, fear and a racing heart — but this study, carried out by Lauri Nummenmaa and friends, is exciting because it uses a very large pool of participants — 700 people from Finland, Sweden, and Taiwan — and is controlled for nationality and language. In other words, despite differences in language and culture, it seems that all humans have very similar, genetically-coded physiological responses to emotions. Our chests don’t puff up with pride just because the idiom tells us to; pride really does make your face and torso feel good. To create these maps (view larger), the 700 participants were shown a variety of emotional words, stories, videos, and images. They were then asked to paint two human silhouettes on a computer; one to show where they felt increased sensation, and the other for decreased sensation. The researchers then compiled all of the maps, being careful to mitigate the effect of sensation-specific phrases (cold feet, heartbroken, hot-headed, a shiver down your spine), and to remove any “anomalous painting behavior” (doodles, symbols, etc.) The two silhouettes were then combined, and then the combined images from all participants were averaged to create the final maps. 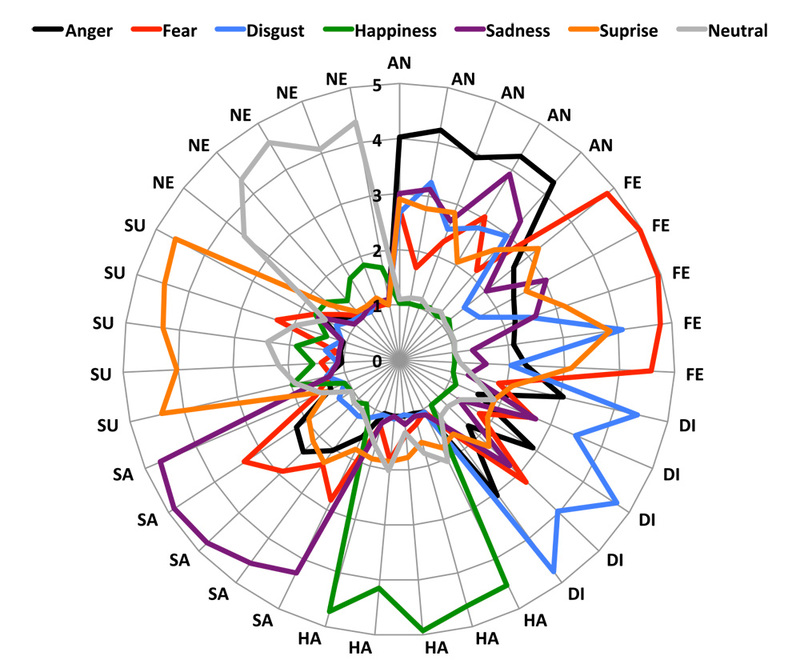 This interesting diagram shows the participants’ emotional responses (colored lines) to stories that were intentionally tailored to elicit that emotion. The target emotion is shown on the perimeter. You can see that angry stories also made people sad and disgusted, but happy stories only elicited happiness. Looking at the maps, it’s amazing how each emotion triggers a very specific and unique physiological response. Happiness and love are the only emotions that increase sensation below the waist. Sadness decreases the feeling of everything, except for the heart and parts of the face. Depression is an all-over lack of sensation. It is startling to see shame’s intense increase of sensation in the head and cheeks, fluttering heart and stomach, and numbness of legs so accurately depicted. Now we just need to work out why and how each emotion triggers such a physiological response.